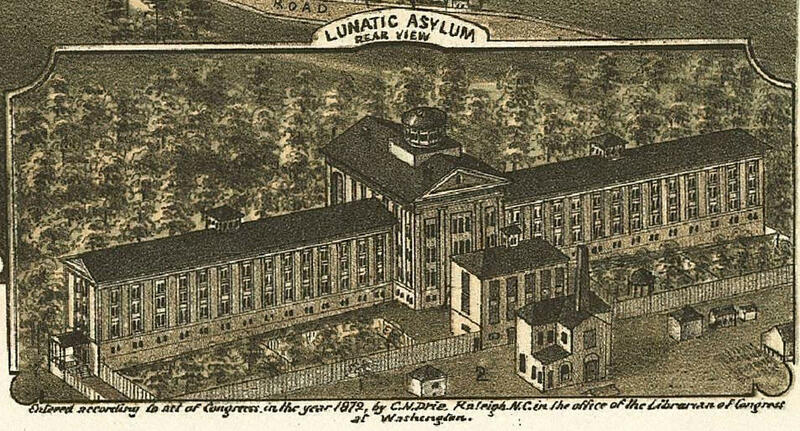 In an 1872 "Bird's Eye View" of Raleigh, the Dix Hill Asylum (now Dix Hospital) was labeled simply "Lunatic Asylum." Credit LEARN NC, UNC School of Education. Photographer Jon Crispin spent five years shooting a collection of more than 400 suitcases discovered in an attic at the Willard Psychiatric Center in upstate New York. The intimate portraits are widely acclaimed for adding a layer of humanity to patients who might otherwise only be remembered by their hollow medical records. When Rose Hoban, founding editor of North Carolina Health News, saw his work, she knew it could serve as inspiration for the Raleigh community that is trying to figure out how to memorialize the now-closed Dorothea Dix Hospital. Host Frank Stasio speaks with the founding editor of North Carolina Health News Rose Hoban and photographer Jon Crispin. Host Frank Stasio speaks with Hoban and Crispin about the efforts to preserve the unique living history of the patients, the people who worked there and the families who grew up on the hill where Dorothea Dix Hospital once stood. North Carolina Health News hosts a community event on Sunday, Oct. 16 to open dialogue on a Dorothea Dix Hospital memorial. Crispin talks as part of the event, and some of the Willard Suitcase photographs are on display at the Mahler Fine Art Gallery and the Busy Bee café in Raleigh through the end of the month.